Weanafeeda was developed by a Cumbrian Vet and his wife with advice from top breeders. Weanafeeda is innovatively designed to solve the problems associated with the feeding of a litter of pups at the weaning stage. Weanafeeda is available in 5 different sizes to suit all breeds. The Mini 4, Maxi 4, Mini 6, Maxi 6 & Micro 3 – all come complete with quality stainless steel bowls. 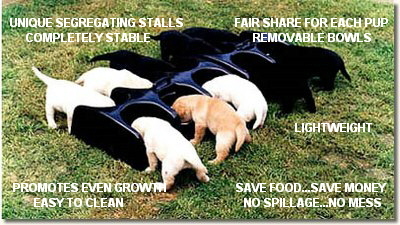 Just look at the pictures in the Gallery of puppies feeding from the innovative litter feeding system. There is no other feeder for pups designed specifically for puppies allowing them to feed individually in a communal situation. Weanafeeda prevents spillage, is easy to clean – ready for the next feed. Weanafeeda is a training aid, pups associate it with food and feeding times. It ensures pups are used to feeding individually when they go to their new homes. The Maxi 4 Weanafeeda is suitable for medium/large to giant breeds. The Maxi 4 c.. The Maxi 6 Weanafeeda is suitable for medium/large to giant breeds. The Maxi 6 c.. The Mini 4 Weanafeeda is suitable for all medium & small breeds. The Mini co.. The Mini 6 Weanafeeda is suitable for all medium & small breeds. The Mini co.. The Micro Weanafeeda is suitable for all tiny breeds of dog, small kittens and r..